Organize your tailor trip to Cuba with us. You can of course enjoy a wonderful holiday in a high quality all inclusive resort. However we really believe that would be much more interesting and joyful if you travel across the Country and discover the authentic Cuba. Cuba is an special Island full of charms. Not only because its beautiful beaches or its own history but also because of its different landscape. If you like mountains you will find beatiful landscapes with extraordinary caves ready to be discovered, also waterfalls, rivers can be found and if you like beaches then you should find some of the most beautiful beaches you have ever seen with crystal clear waters, thin and white sand and almost virgin beaches. You will find unique places under water full of reefs and coral reefs with an underwater animal kingdom that everyone should visit. Therefore activities like diving, scuba diving, surf, fishing, snorkeling, etc. are very recommended during the whole year. Tropical weather conditions make you enjoy beaches during almost the whole year with high ambient temperatures. Where you will be able to visit Art Museums, Ancient Museums, Forts, Churches, Palaces and where you will enjoy watching buildings with an arquitecture from the XV-XIX Centuries and learn a history that began back in the XV Century. Do not forget to try a typical Cuban dinner and be open to discover the Cuban traditions. Did you know Cuba is one of the few Countries, if not the only one, where you still see many oldtimers driving around? They are using the original body cases but inside they are using modern engines. Also inside the car many original parts and components can be found. Enjoy a nice cocktail or an authentic licour such as “Mojito” or “Daiquirí”, taste a nice Cuban cigar “Cohíba” or “Partagás” and enjoy the “salsa dancing” moving all your body. Make it an unforgettable moment! Enjoy your visit staying in our casas particulares (B&B) and eating in de private and family restaurants Paladares. 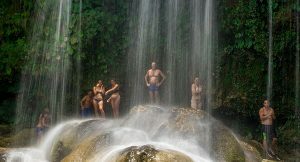 By doing so you will interact with the daily Cuban life and you will learn in a more natural way their customs. Cuba is a very safe place to go to spend your holiday. You can enjoy the Country at any time of the day or night without any fear that something could happen. If you ever feel lost, you could always ask the locals who will be glad to help. I dare to say that Cuba is the safest place on the Caribean Region. Why Cuba? It is a Country you must visit at least once in your life. You will never regret it. I am sure you will go through unforgettable experiencies that you will remember forever. The quality of the roads in Cuba are different depending on where you are, especially outside of the cities you will find the road in poor condition or with low lights. This is why I recommend you to try always to drive during daylight. Police in Cuba is very strict in regards to traffic violations, so I would recommend you to respect always the traffic the signs. Don’t wait until the last moment to fill out the fuel tank, because the distances between stations can be longer than expected. Reduce the speed as soon as you see a sign stating “Punto de Control” “Check Point”. Here police is checking for documentation and speeding. Just bring your dreams, your wishes and ideas, and our Cuba specialist will make de perfect Cuba vacation for you! We can offer trips to suit all tastes. Check out our tours including: Family with children, Salsa tour, The island of your dreams, and many more!